Gunpowder Tea is a well-known Chinese green tea, native to Zhejiang Province, in the eastern coast of China. This famous tea gets its name from the shape of the leaves. Rolled into tiny black pellets, the leaves were mistaken for gunpowder grains. Come and share a cup of this unique green tea with us. At the same time learn how each cup of tea you drink will provide you with numerous green tea health benefits. Taste a wonderful tea in its original Chinese way and then travel around the world to find it inside a famous tea blend that is enjoyed by many people. Can you guess what this blend is? Pick up your cup of tea and let us begin our journey with a quick look at the history of this green tea. We begin our story in China, in the Zhejiang province, during the Tang Dynasty (618 - 907 AD), where this tea was first produced. 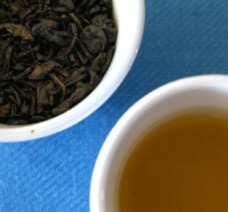 Originally called Pearl tea, or zhu cha, Gunpowder green tea has been delighting Chinese tea lovers since. So where does the name Gunpowder tea come from? Some say, this green tea got its English name in the 18th century by a British clerk, due to its similarity with gunpowder pellets. Others say that it was the very British sailors that were taking this tea from China all the way to the West. In the beginning green tea leaves were picked by hand and then withered to remove moisture, steamed and then rolled into tiny pellets, again by hand, very carefully so as not to break the leaf. Nowadays, machines do the picking and rolling, except when preparing higher grades of Gunpowder green tea. This rolling method allows the leaves to stay fresh longer than other teas, retaining more flavor and aroma while protecting the leaves from possible damage. This method is often used to produce Oolong teas. Tie Guan Yin is a fine example of it. Have a look at it and discover what Oolong tea has to offer you. Moving forward to the present day we find that Gunpowder tea is produced not only in the Zhejiang Province, but also in the Chinese provinces of Guangdong, Anhui, Hunan and Fujian. And we can also find it outside China. 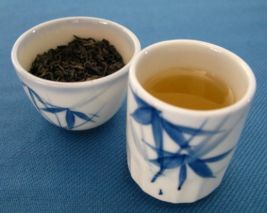 Therefore, depending on the type of leaves used and where they came from, you can enjoy several types of Gunpowder green tea. Pingshui Gunpowder is the most common variety and it is usually sold as Temple of Heaven Gunpowder or Pinhead Gunpowder. Pingshui is the name of the town in the Zhejiang province where this tea was first grown. It is only fitting that Chinese varieties of Gunpowder tea still take its name today, don’t you think? With this particular variety of tea you will enjoy a more powerful aroma, color and larger pellets. Formosa Gunpowder is grown in Taiwan and it stands out for having its own character. Its fragrance differs from Gunpowder green tea grown in the Zhejiang Province, because the processing method behind this tea is very close to that of Taiwanese oolong tea. This is why Formosa Gunpowder resembles in taste and fragrance to fresh or roasted oolongs. Ceylon Gunpowder is produced in Sri Lanka at high altitudes (approx. 1.800m). Though this country produces mainly black tea, green varieties of tea are being produced using the same rolled leaf method that characterizes this tea. 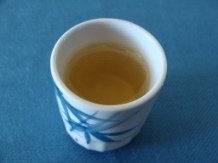 Unlike other green teas, such as Sencha tea or Bancha tea, this peculiar drink is unroasted and denser than most teas. It is refreshing, magical and it offers you a soft honey taste, followed by a smoky hint. 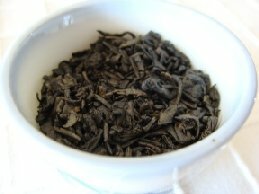 This smokiness so common in this type of tea is also the result of the leaves that are used to make it. While some finer teas use the bud and first small leaves of the tea plant, to make Gunpowder tea pellets, the tea pickers choose larger and older tea leaves. This is a strong characteristic that you may also find in Lapsang Souchong tea, a Chinese black tea. Let us move on! Care for another cup of this tea while we enter the fantastic world of Gunpowder green tea health benefits? The sweet taste and nutty aroma are combined with powerful green tea health benefits which keep you and your loved ones protected and healthy in many ways. Gunpowder green tea, like all green tea, is extremely rich in antioxidants, especially catechins and the most abundant is the EGCG. Green tea antioxidants have the ability to inhibit the enzymes that produce free radicals, thus preventing the development of cardiovascular diseases. Green tea can also reduce the chance of having coronary artery disease. It inhibits atherosclerosis and prevents the formation of blood clots! If you wish to lower blood pressure, cholesterol and your triglyceride levels, this is a good way to start! Destroying free radicals, this green tea inhibits the necessary enzymes to the growth of cancer cells. The combination of flavonoids, catechins and minerals strengthen your metabolism and make it much stronger to fight cancer. Protect yourself with a cup of this tea every day, you deserve it! Studies have shown that if you suffer from diabetes, drinking green tea may improve glucose tolerance and insulin sensibility. Combine a daily cup of Gunpowder tea with healthy eating habits and you may be preventing type II diabetes! How amazing is that? Green tea tastes better unsweetened, so it is a great way to lower your sugar intake! How to lose body fat in a healthy and fast way? Well, as you know there aren’t miracle diets but this Chinese weight loss tea may help you. Gunpowder tea, as a green tea, combines three major allies that burn fat and build muscle: catechins, caffeine and theanine. Together, they will boost your metabolism and allow you to burn fat much faster. It is a great coffee alternative since it has more caffeine than other green teas, 35-40mg per serving. It will increase your exercise endurance and you will burn more fat in a healthier way! So start exercising and drinking Gunpowder green tea to feel healthy and energetic! Sneezing, coughing or fever… Are you feeling symptoms of flu coming? Don’t worry. The key is to fight it as soon as possible, so why not start drinking Gunpowder green tea? Green tea antioxidants, especially EGCG have been known for inhibiting influenza symptoms and reducing the duration of the disease. Give this flu treatment a try. This green tea is a treasure waiting for you to discover. Have a look at our page Green Tea Health Benefits to enjoy everything this beverage has to offer you. Try this wonderful Chinese Green Tea now! 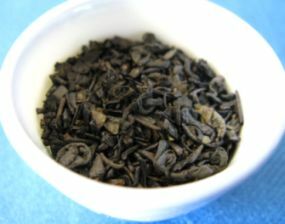 Now that you know all about the importance of drinking green tea, let’s get ready to brew Gunpowder tea to perfection. It is a very important and yet an easy process, that you will master in no time at all. How to make Gunpowder tea? 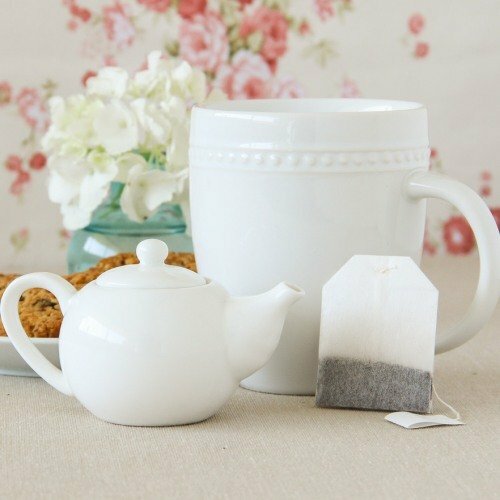 Brew your tea in porcelain tea ware. If possible, choose a white porcelain tea cup so that you can see the true color of your tea. In the Chinese style, tea is brewed in gaiwan, a Chinese lidded bowl. Also very important is to always use spring water to enhance and protect flavor of your tea. Tap water may alter the flavor of the tea, as its taste may vary depending on the mineral content of the water sources in your region. Always rinse your tea cups and tea pots with hot water to clean and warm them. This will help maintain the temperature of tea. The ideal water temperature should be 70ºC - 80ºC (158ºF - 176ºF). Green teas are more delicate, so you shouldn’t boil the water. If you are becoming passionate about tea, consider buying a thermometer in a tea shop. Since Gunpowder is denser than other teas, use just one teaspoon for every 150ml of water. Let it steep for 1 minute for the first two brewings and increase the steeping time for the following ones. Feel free to try different steeping times till you find the one that suits you better. The rule here is: the longer you let your tea brew, the stronger will be its taste. Now, enjoy some moments of pure pleasure and delight. 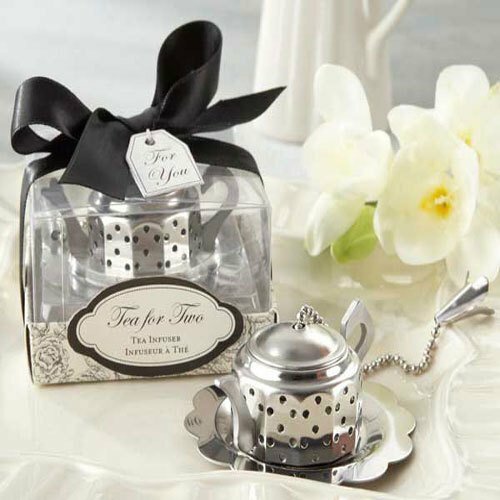 Observe how the pellets unfold in your teapot from those tiny little balls into beautiful large tea leaves. Inhale that smoky and nutty aroma and enjoy that marvelous yellow liquor in your cup. Here’s a tip: Do not add milk or sugar. This tea does not need it. If you feel you just can’t drink your tea without sugar, then just add a little bit less every time you brew yourself a cup of this tea. Very soon, you’ll be able to enjoy your unsweetened tea. Ready to try this tea? Well, when buying Gunpowder, make sure to look for shiny, small, tightly rolled pellets. These are indicators of high quality tea. 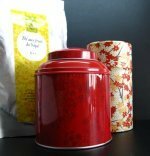 To keep your tea fresh for long periods of time, it is important to store your tea somewhere cool, dark, dry and airtight. You can use your Gunpowder tea to create wonderful green tea recipes! Combine it with red meat or strong flavored dishes. It is a world worth discovering! The perfect blend... Moroccan Mint Tea! From east to west, Gunpowder tea made its way to North Africa. In search of new markets to expand the tea trade, the English brought Gunpowder tea to Morocco, in the 18th century. Slowly, it became part of the local culture, to be enjoyed by all society, from the wealthier urban population to the rural poorer people, becoming even more popular in the 19th century. Gunpowder tea is blended with peppermint leaves, sweetened with honey or sugar to create a famous blend called Moroccan Mint Tea. Other herbs may be blended with this tea, according to the season, but it is the refreshing and cooling mint tea that is today enjoyed worldwide. Isn’t it wonderful how a simple tea leaf can have so much history and touch every part of our mind and body with its healing power? As you may see, drinking green tea is indeed a pleasure and a gift. Buy Your Gunpowder Tea Today! Click on the image or on the link below to purchase from Art of Tea your Moroccan Mint Tea . Fine Chinese Gunpowder tea blended with organic peppermint and spearmint just for you. This makes a cup of tea that is both and refreshing. It is a taste so perfect that you will drink it again and again. Every sip is a world of benefits and flavor just waiting to explode in your mouth!